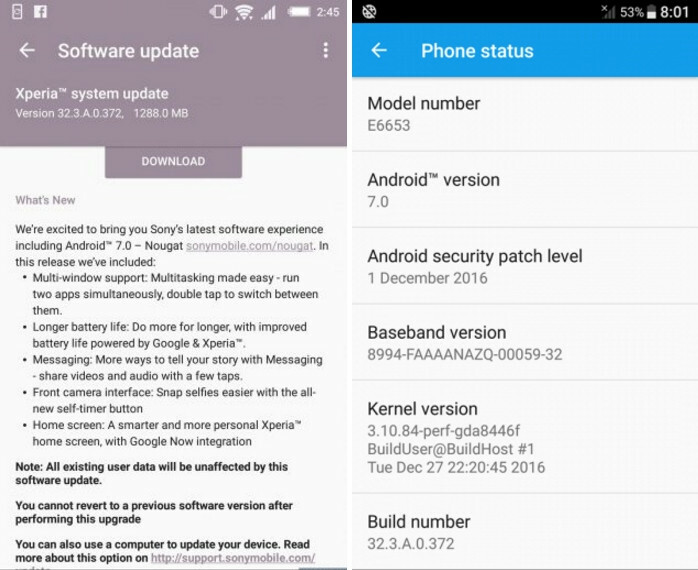 Sony has started rolling out the Android 7.0 Nougat firmware update to some of its premium or flagship smartphones including the Xperia Z5, Z5 Premium, Z5 Compact and most of their variants like the Dual/Single SIM E6653, E6683. The Xperia Z3 and Z4 series phones will follow, most likely, with the current firmware build 32.3.A.0.372. The new features include Multi-Window support, new messaging app, performance and battery improvements, manual settings, and a new UX from Sony. the Nougat OTA is rolling out in the European region, India, Japan, Australia, etc. The US variants like T-Mobile, Sprint, etc shall be updated soon. Although there is no news for the Xperia family to receive the Android 7.1.1 Nougat firmware, the Android 7.0 is liked by most. However, some have reported of bugs and instability and there are rumors of Sony pulling off the update in some regions. The update works great with the Xperia X family and has been around since long. We have listed the Nougat Z5 and its full firmware files below. Also, check out what’s new with Xperia Nougat 32.3.A.0.372 OTA. Currently, the firmware files for AU and the Indian variants of Xperia Z5 have been captured. We will be updating the files as soon as they are available. Meanwhile, you can download the latest firmware using the Xperia firmware tool listed below. Moreover, if you want to download the firmware for your Android device, then you may want to install the XperiFirm v5.0.0 software on your PC. Run the XperiFirm and download the latest available update for your Xperia device and the specific variant. Once you have successfully downloaded the stock Nougat firmware FTF file, head over to our Z5 tutorial on how to install the Sony firmware using latest SP Flash Fool.